Today on the Doc On The Run podcast we’re talking about 3 keys to less time on crutches. It’s still hard for me to believe that the same crutches, the same design that doctors hand out to patients today are more or less the same kind of crutches handed out to injured soldiers during the Civil War. Pretty much everything else has changed in terms of technological advancements in medicine. But we still have this one archaic tool to help an injured runner heal faster. And although crutches are truly terrible, they can be a useful treatment to help any injured runner heal faster. But you as a runner have to understand there’s a very high price to pay for using crutches. With one week of immobilization and non-weight-bearing on crutches you will have a 17% reduction in the muscle diameter size in that lower extremity. At six weeks, the damage is 60% and you actually can wind up with permanent atrophy as a result of being on the crutches too long. That’s right. You can actually get permanent weakness as a consequence of using the crutches. Crutches are uncomfortable. Your armpits are going to be raw. Your back is going to ache from holding your leg up in the air. And yes, you might even slip and fall off the crutches. Crutches are inconvenient. If you haven’t ever been on crutches you can’t fully appreciate how difficult it is to move around and do anything. Try moving from the kitchen to the couch with a full cup of coffee. Better yet try to do that while you’re also carrying a laptop computer. You can’t carry even a plate of food. And there I stood, like a dunce on my crutches eating my dinner, standing at the kitchen counter, leaning on the crutches. You can’t go up and down stairs. At least not safely. I’ve had more than one patient fall down an entire flight of stairs when trying to descend stairs on crutches. One of them even got a concussion. You can’t really drive and be non-weight-bearing either (unless its your left foot AND your car has an automatic transmission). After my knee surgery, I actually had to trade cars with someone so I could drive an automatic instead of my car that had a standard transmission. Crutches actually do damage to you as an athlete. This of course is the one I mentioned at the beginning and it’s the one that worries most runners. You work so hard to earn all of your fitness, the last thing you want to do is lose it. You need to spend as little time as possible on the crutches. So here are my top 3 tips for getting off the crutches ahead of schedule. Talk to your doctor about getting off the crutches sooner! I was recently given a lecture on stress fracture healing at a medical conference. I asked the audience, all doctors, when they would let a runner start running. I asked him to define “healing.” He said that when he could see evidence of healing on an x-ray, some proof that the bone was healed; that would be the time he would let them start walking and subsequently advance to running. Maybe the bone looked healed the day before you took the x-ray. Maybe the bone was healed the week before you took the x-ray. Maybe the bone was actually healed two weeks before you took the x-ray. If the bone was healed two weeks before your doctor takes an x-ray, in my mind, you’ve wasted two weeks on crutches when you could’ve been out running. The point here is to make sure that your doctor isn’t sticking you in some standard protocol like two weeks, four weeks, six weeks, two months or any other arbitrary evaluation interval. You need to be evaluated more frequently than a standard patient if you really want to get off the crutches as early as possible. So ask your doctor if there are any other things you can do aside from the standard treatments to make you heal faster. 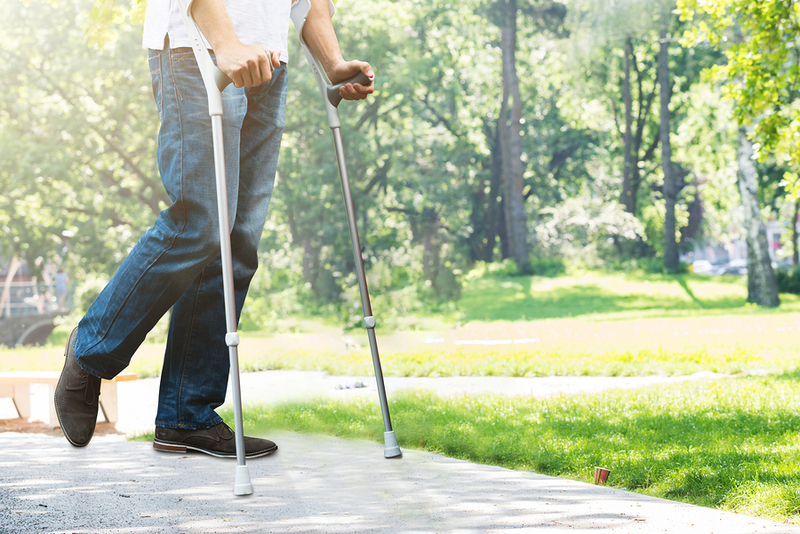 Ask the doctor if you can be seen more frequently so that you can get a more accurate assessment of when you’re actually healing and ready to get off the crutches. Don’t accept any standardized treatment protocol. Tell your doctor you want the fast track. If you are going to be non-weight bearing, be all in. Think 100% non-weight bearing. Do not put your foot on the floor. Don’t use your foot to help step out of bed. Remember, if you step on the foot you’re going to apply pressure and undo some of the healing during the fragile early stages of healing. Think about it in terms of a cut on the back of your hand. What would you do if you wanted to heal as fast as possible? Would you cover it up with a Band-Aid? Would you try to use that hand less? Or, would you move your hand around in circles and pick at the wound all day? Which scenario would let the skin heal faster? Seems obvious right? Because the foot is so necessary to moving around people seem to cheat when they are using crutches. You use your foot to help get up off the couch. You use your foot to stand up when you’re getting out of the car. Because of those occasional pushes here and there, you are not really 100% non-weight bearing. You’re cheating yourself and if you cheat, it’s going to take a whole lot longer to get the result you want. Remember, the result you want is to heal the foot and get off the crutches as soon as possible. The sooner you get off the crutches, the stronger you will be. The stronger you are, the less chance of re-injury. So it really is of paramount importance that you are 100% committed if you want to get back to running as soon as possible. Be diligent. Be 100% in and do not step on your foot. The more committed you are to the process in the early stages, the shorter that process will have to be. If you wait until your injury is completely and totally healed, then you can confidently drop the crutches and just start walking. But to be able to do that, you have to wait until your foot is completely healed. That could take a long time. Just remember the weakness numbers mentioned above. 17% at one week and 60% at six weeks. 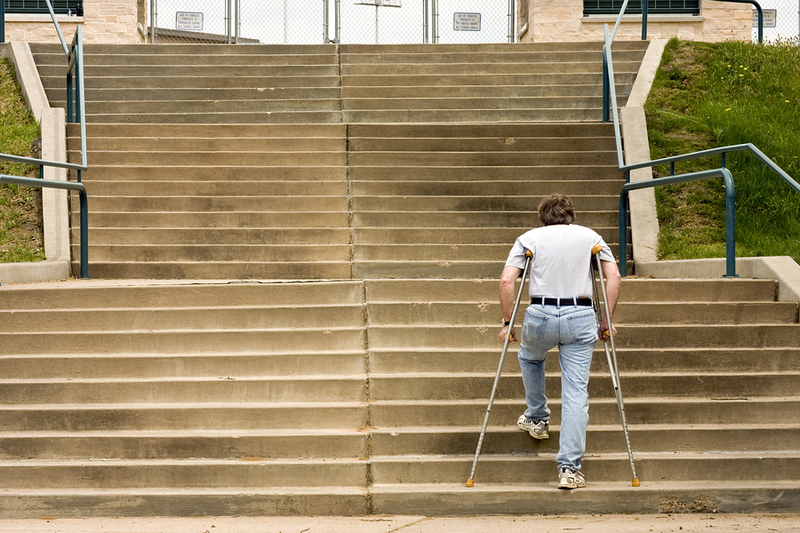 Do you really want to wait until you lose 60% of your strength in that leg before you start getting off the crutches? I bet not. Instead, you have to realize that you are continually healing. Every day you’re a little bit stronger. Every day you’re a little bit more healed than the day before. At least, you’re more healed every day as long as you’re 100% in. At some point during the process of healing you may not be 100% ready to start walking without crutches. But you might be ready to start applying a little bit of pressure. You might be ready to start a little bit of range of motion. You might be ready to start a little bit of exercise. So, the most important task for you and your doctor when you’re on crutches is to figure out when you can start moving. When can you start applying some pressure to the foot? When can you start putting your foot on the ground in a very deliberate, reliable way that will allow you to regain some strength and apply some stress without un-doing the healing? Don’t just ditch the crutches and start walking. When you get done with the crutches that is your highest risk moment of re-injury. Your muscles in that leg are going to be weak. Your ankle is going to be stiff. You are going to be uncoordinated. And you are still injured! Protect the foot and ramp up the pressure on your foot early and deliberately. That’s exactly what I do with athletes when they’re injured and I think they need crutches. I always help them figure out how much healing has taken place. I help them move from 100% non-weight-bearing to some protected partial weight bearing in a way before we expect the foot to be completely and totally healed. I even have an entire series of video lessons that teaches runners how to make those assessments and advance safely from a period of strict non-weight-bearing on crutches back to walking…without getting re-injured. Remember, if you start advancing early and you get off the crutches sooner, it will really fight that loss of strength that could otherwise cripple you as a runner. So whatever you do, don’t just wait for some 4 week, 6 week, 8 week or 12 week appointment with your doctor. Don’t just wait for something to happen on an x-ray. Make sure you understand how to get moving sooner. Be all in, fast-track the process, and then make sure you understand how to transition as safely as possible off of the crutches, and stay ahead of the schedule!